HomeMary Ellen’s Helpful Hints: Or What is Mary Ellen Trying to Say? Mary Ellen’s Helpful Hints: Or What is Mary Ellen Trying to Say? Hello Dear Readers! Today is a life changing day. After reading today’s post, you will not only go away a person of exemplary character, you will, more importantly, know exactly what to do to keep your liver tender! 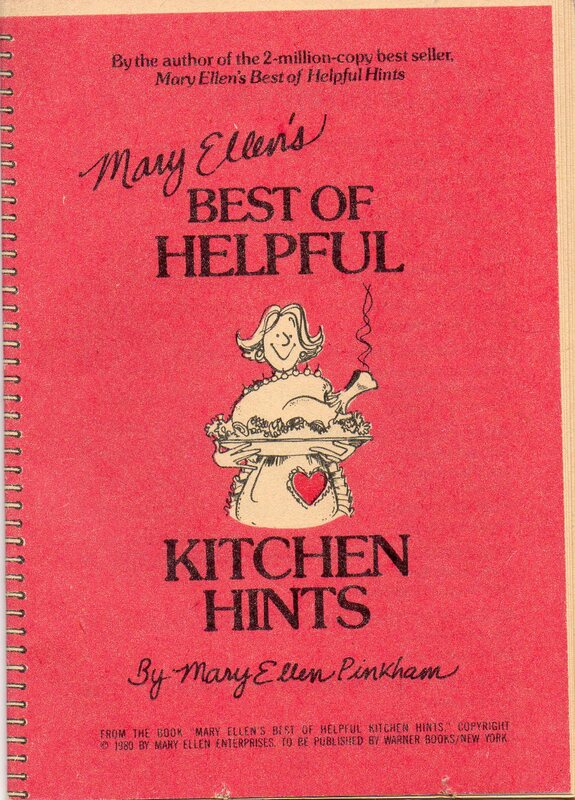 So without further adieu, let’s start changing our lives by way of Mary Ellen’s Helpful Kitchen Hints! This diminutive dossier written by the demure hand of Mary Ellen Pinkham back in 1980 is our golden ticket to efficiency in every single area of lives except bowling. Corn on the Cob Not in the Teeth! This is just the kind of hint we love Mary Ellen so dearly for. In a mere 19 words, Mary Ellen has managed to solve the centuries-old heartbreak of that awkward, corn-silky smile! Oops, I think Mary Ellen forgot to mention to be sure to remember to clean off your husband’s toothbrush and put it back just as he left it when you’re done de-silking corn with it. (He’ll never know!) Oh Mary Ellen, you sly one you! Oh we’ll be thanking our beloved Mary Ellen for years to come for this one! Simply go to your local hardware store and find something shaped like a tube, like maybe a pipe. Then stop off at the welders and have it welded into the length of a package of bacon. After that, there’s only one more stop to make at Office Depot where you can purchase rubber bands. Now, Mary Ellen doesn’t make mention of what size the rubber bands should be, but listen, Mary Ellen knows there are some just things in life we have to figure out for ourselves, Dear Readers, and I’m afraid this is one of them. But it will all be worth it because, in the long run, we’ll be saving ourselves valuable time when it comes to peeling one piece of bacon apart from the one it’s stuck to. And what could be better than that? The answer is zilch, people, zilch! And now for the pièce de résistance, Dear Readers! The reason that you have read thus far and that is to find out the all important information of how to keep your liver tender! Well, our Dear Mary Ellen simply takes the liver, soaks it in milk, refrigerates it two hours, dries it, breads it and sautes it. Well, if it worked for the livers of Mary Ellen’s cat and Mary Ellen’s parakeet and Mary Ellen’s husband, whose to say it won’t work for us, Dear Readers? LOL!! Okay. Your liver stays put. Mine too. I have left my heart in San Francisco a couple of times, but it was always there waiting for me in the lost and found! Phew! Do people actually routinely remove the corn silk? I must be the worst husker EVER. I had no idea. Also, regarding cottage cheese, how does the cottage cheese know which side is up and which side is down? Is lid placement for the container that important? What if it’s like ketchup and the lid is on the bottom? Then do you store it right-side-up or do you flip it and store it right-side-down? You know what? Nevermind. I have a headache and frankly, I don’t care a fig for cottage cheese. I don’t care a fig for figs, too, unless they are in newton form. I wrote these down, and, I wonder if I store the liver in the upside down carton of cottage cheese, will I kill two birds with one stone? Ha! That is such a good questions Addie. If only we knew how to contact Mary Ellen (I think she joined the witness protection program after a lot of people became violent after storing their cottage cheese upside down — but it got stale anyway!) Do you happen to know anybody influential in the FBI? Not that I can admit to knowing. You’re a riot my dear! My favorite blogger in a long, long time. My liver is already tender, thanks to repeated applications of Jack Daniels over the years…. 🙂 Who needs milk? (Since I am leaving NOT knowing how to keep my liver tender, does that mean I can apply to get a refund? Just wondering….) Ta ta,dear, and say hello to Mary Ellen…. HAha!! Well I think tender livered is much better than lily livered! Even if it does require a marination in Jack Daniels. Oh that sounds fascinating. How to treat the servants! it was so nice of her to include that! LOL! My husband’s liver must be really tender, he drinks gallons of milk. If anyone ever decided to cut it out and sell it on the black market it would be worth a lot. Melk! It does a body good. Lol Mary Ellen is so smart and savvy. I especially like the tip about using our husband’s toothbrushes on the corn silk. Maybe once you take all the corn silk off, you can put the silk in the blender and make silk juice. Just a thought. I’m trying to channel my inner Mary Ellen here! I think, after reading several tips of Mary Ellen’s that I can safely speak for her when I say that that idea of making juice out of cornsilk is so good she will secretly wants to gouge your eyes out! 😀 And that is really the highest praise anyone can get in the helpful hint industry. Congratulations Lily!! that liver technique totally works! One hour will do actually, the key is fresh liver 😀 haha.. preferably not parakeet though. Hmm… what else has Mary Ellen been using her husband’s toothbrush for, eh?? That’s what I’d like to know!! P.S. Storing Funyuns upside-down will not make them last longer, if Al Gore is within 200 miles of your home. P.P.S. Psssst! 37!! I’d keep my toothbrush under lock and key, if I were you!! LOL!! Poor 37! If he’s not worrying about where his toothbrush has been, he’s having to worry about Al stealing all his Funyuns!